Add a BAR barrel nut for only $20 more (select from drop down menu above). The Aero Precision handguards use the BAR interface and do not work with a standard barrel nut. If attaching this handguard to a standard threaded AR15 upper receiver, you must use a BAR barrel nut (select from the drop down menu above). If you are using the Aero Precision M4E1 Enhanced Upper Receiver, no additional pieces are needed. 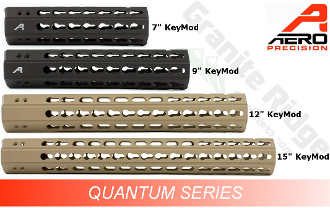 This handguard is specific to the AR15/M4E1 platform. It is not compatible with the M5 .308/M5E1 platform. If using A Magpul MBUS flip up front sight, slight modification may be necessary to correctly operate the flip up lever (due to rail angle/design).